You CAN get through anything! You CAN be victorious! You CAN have joy! Pray for those who are going through worse...yet still praising God! 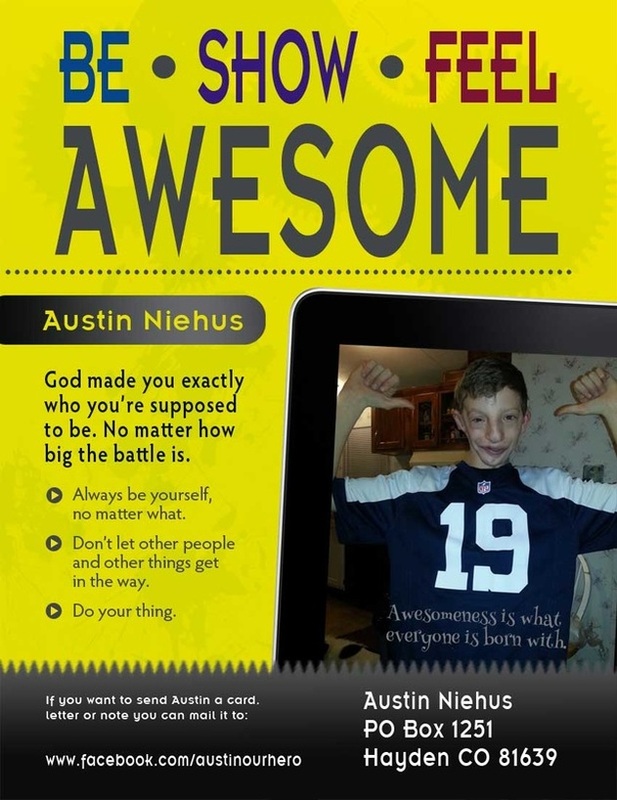 Austin is facing his 53rd surgery in June 2015. He was born with Goldenhar Syndrome which is a rare genetic condition that causes a craniofacial birth defect of the face and head, usually affecting the eyes, ear, and vertebrae. Austin is a kind, intelligent and gentle young boy even after enduring bullying most of his life. What would you want to potential do or say to help people who are in the same situation as you? • One is to always be yourself, no matter what. • Two, don’t let other people and other things get in the way. • Three, do your thing. If you had one message to get across to someone what would that be? • Be Awesome! Awesomeness is what everyone is born with. • God. Because he has helped me and created everything that has happened. He helped me touch every viewers heart whether it’s postive or negative He still touched their heart. God made you exactly who you’re supposed to be. No matter what circumstance you’re in. No matter how hard the struggle is. No matter how big the battle is. Who has been there right beside you besides me? Do you think you’d be sitting here without them? • Because God and Jesus help me. Despite everything that you have gone through, you’re still here, you’re fighting, and you’re being awesome! What are you going to tell everyone?